If you have to work in a dusty environment (construction, manufacturing facilities, dirty bedroom, windy desert, etc.) and your computer must be running continuously (for example, it is a server), your computer will get full of dust and dirt inside, very quickly. That dirt can cause overheating problems, because they prevent the heat exchange between air and the components’ surfaces. Also, the fans eventually get stuck, worsening the overheating problem. And mechanical components (like your CD or DVD reader/writer or your floppy driver) will stop working pretty soon. Your computer is like a vacuum cleaner. It contains at least one fan which continuously move air from the inside of the computer to the outside environment. Yes, that’s the power supply fan, but your computer may contain one or more extra case fans. If it is moving air from the computer to the outside, how is it like a vacuum cleaner? Well, air has to enter somehow to be moved out again. That air enter through every hole in the computer, including your floppy and CDROM drives. 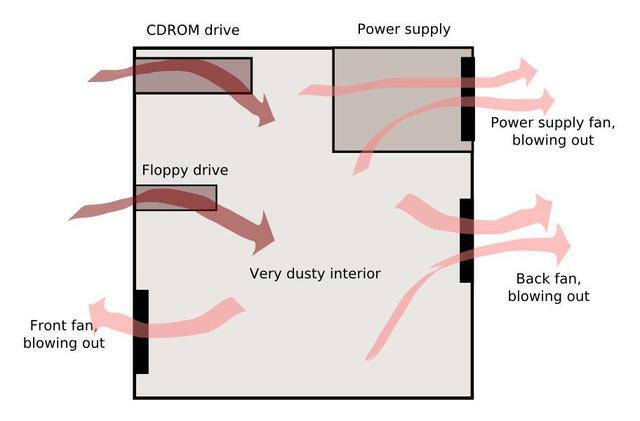 If the external environment is dusty, the dust will enter the computer along with the air. But it won’t get out as easily. Figure 1. Simplest ventilation setup, where air is moved out only by the power supply fan. 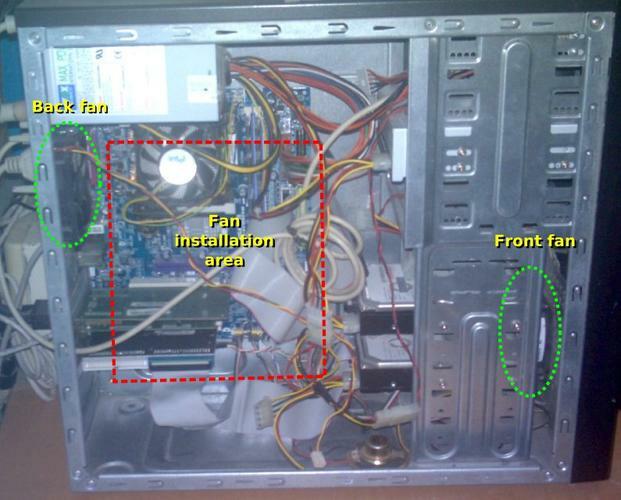 The external air enter the computer case through ventilation holes and, to a lesser degree, through non-ventilation holes (including the floppy and CDROM drives). 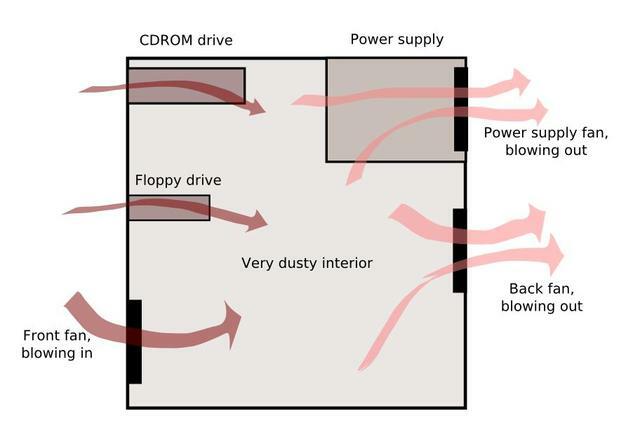 If the external air is dusty, the result is a dusty interior. Figure 2. Common setup with one additional fan in the back side of the case, blowing air out from the case. 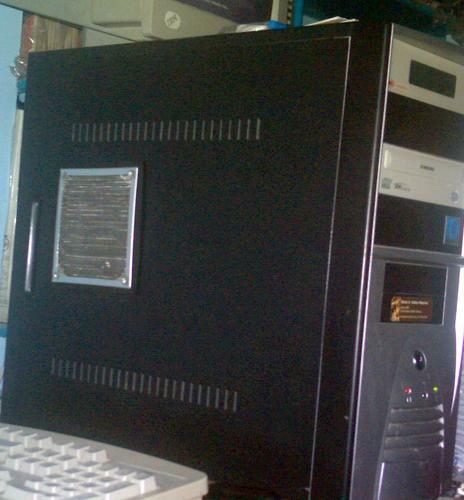 The result is more air entering the case from the outside, through the ventilation holes and floppy/CDROM drives. The result if a dustier interior. Figure 3. Another common setup, with two additional fans, one on the front (blowing air into the case) and one on the back (blowing air out from the case). Used by many people who need more cooling for their computers (gamers, overclockers, etc.) which cause a very dusty interior. This is the setup I used before. Figure 4. A variant of the above, now with both additional fans blowing air out. Most air enter through the ventilation holes and drives. Figure 5. A variant of figure 3. The incoming air fan (front) is filtered. Usually, filters reduce drastically the volume of air that a fan can blow. So, most air is still being moved by the back fan and the power supply fan. 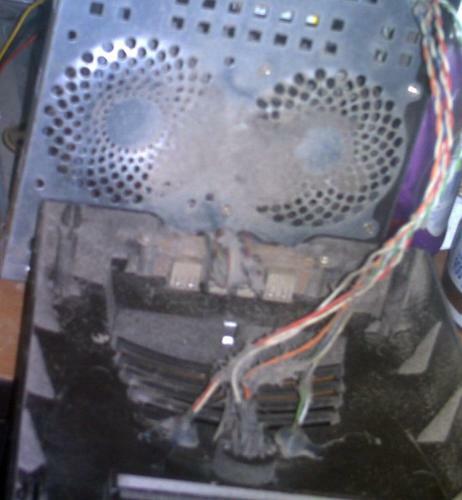 The result is that the filtered air is not the main source of external air coming into the computer case, resulting in a dusty computer. The first and obvious way to prevent this is to keep the environment clean. 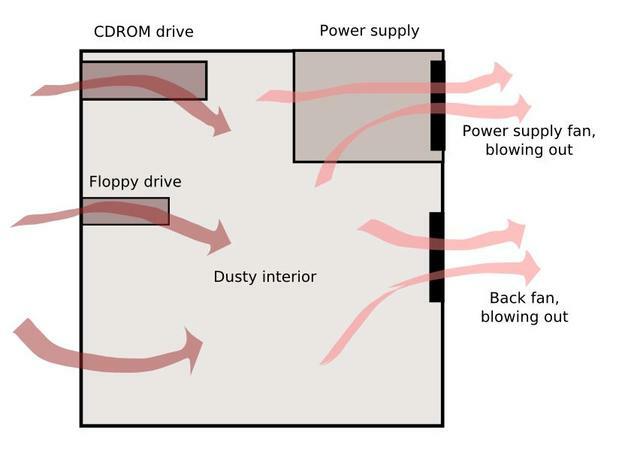 For example, places with filtered air-conditioning systems, with people that clean the room everyday, with the computer case over a desk (like business offices) usually have computers with little dust inside, even after years of continuous use. Also, people who clean their house everyday, have no pets and have their windows closed most of the time, will have clean computers. 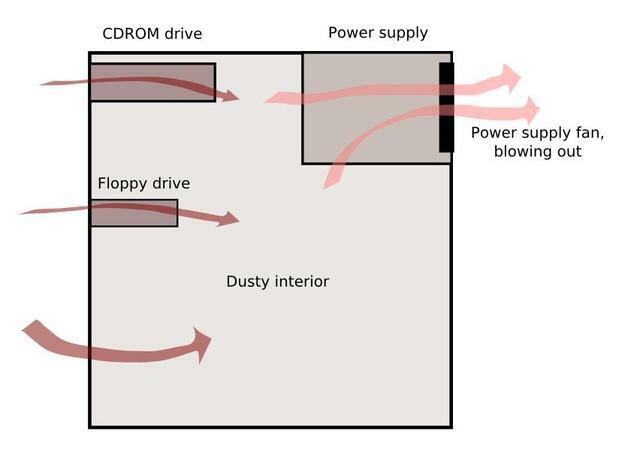 Sometimes, just moving the computer to another corner in the room will change the amount of dust. Dusty places (desert, beach, etc.). Dusty industry (factory, wood or metal workshop, construction, etc.). Computer at ground level (small desk/cubicle, desk design, etc.). Computer runs 24 hours a day (file/print server, monitoring station, etc.). No cleaning (lack of cleaning staff, lazy user, lot of kids, etc.). Hairy animals (pets, zoo, veterinary office). No air filtering (Air-conditioning too expensive or unfiltered). 2) Reduce the need of airflow. You can get a low power consumption computer based on the VIA C3 processor (for example). Some designs don’t even need a fan and run pretty cool and quiet. Or build a computer with water-based cooling. Most designs don’t need a fan anywhere. The best solution I’ve found is to use one DirtBag (http://www.dirtbag.biz/), which is really a bag made of filtering material. You put the computer inside the DirtBag and the dust will never touch the computer. It looks ugly but for very dusty environments, there is no better solution. Dirtbags are not too expensive (around 18 to 25 US dollars) and if your computers are in the wood or construction industry, it can save you lot of money on maintenance costs. This is the solution I will be using. 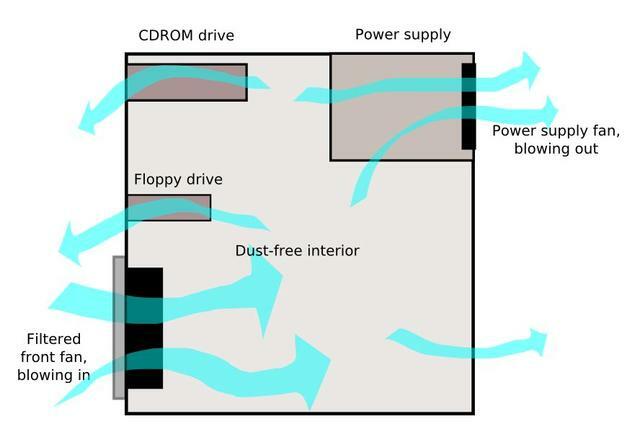 If all air entering the computer is dust-filtered, the computer will stay clean. How do you do that? Well, the idea is to move air into the computer faster than is taken out. Instead of using several fans to force air out the computer, we will user one single fan to force air into the computer. Figure 6. This is the setup we will be using. The main source of air is a powerful fan that will blow lot of air into the computer case. The only additional fan will be that of the power supply. The idea is that all air entering the computer case will pass through this fan (and its filter). The result is that only clean air enters the computer, giving us a clean interior. The only variation we will use is that we will install the fan in the lateral face of the case, not in the front. Please note that “cheap” means “less than the cost of replacing two case fans, one CPU fan and the power supply twice in a year”. The theory is this: if the air is moved into the case, the air pressure will be higher inside the case. So, air will be forced to exit through any hole in the case. That is a positive pressure (inside the case). The inverse situation would be to force the air to exit the case. So, air would be forced to enter through any hole in the case. That would be a negative pressure (inside the case). The choice is simple: if the dusty air is in the external environment, it will be easier to filter the air that is forced into the case (with a positive pressure setup) than to try to filter every hole in the case where dusty air is trying to enter (with a negative pressure setup). A single point for input airflow means a single point of filtering, a single point to maintain, a less expensive setup. The opposite would be to have several fans at several points, which would be harder to maintain and more expensive. The filtering is done with an aluminum mesh cover and a vacuum filter. The aluminum mesh traps bigger particles while the vacuum filter traps smaller particles. If the vacuum filter is too restrictive, the fan will not be able to provide enough airflow, but we can just use the aluminum mesh cover. The fan and the case are not in direct contact with each other. 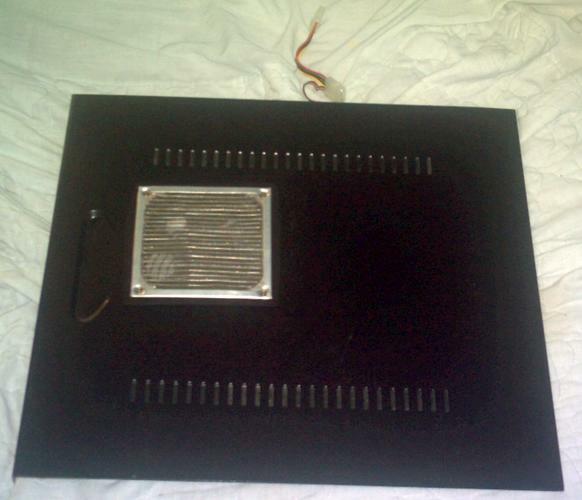 We will use a foam mounting pad to reduce vibration transmission from the fan to the case. The mounting pad is simply a layer of foam between the fan frame and the case, foamy enough to absorb vibrations and tight enough to not let escape air. A fan that can provide more than 100 CFM of airflow, at 12 VDC. An aluminum mesh fan cover. A sheet of acoustic foam. To give you an idea about the 100 CFM flow, note that most fans in computer cases are rated below the 20 CFM, while most high performance CPU coolers have flows under 50 CFM. CFM stands for “cubic feet per minute”, meaning the amount of air the fan can move in one minute. So, for example, if the common tower cases have a capacity of around 4 cubic feet, a fan that blows 100 CFM can change the internal air around 25 times in one minute (on air exchange every 2.4 seconds). Of course that’s the ideal scenario, airflow dynamics can be far more complex. Regarding the power required by the fan, even though we could have use a VAC fan too, we want to avoid the need to build a relay controller to power up the fan when the computer is turned on. I decided to buy this fan because have a good flow (>100 CFM). Other reasons were the option to use a 4-pin molex connector (even if I could have do that myself) and the power consumption (<10 watts). What I did not checked was the noise level. After installing it I found out that 42 dB is simply too high, though we solved it as explained later. The first thing we have to decide is where to install the fan. The best place we found was the lateral case cover. Front and back sides of the case don’t have enough space or have no way to seal the air path. Installing in the lateral case cover have other advantages: easy access, better flow distribution, and more space available. As you can see in figure 7, we have some restrictions on the fan placement, because of the fan’s depth (~4 cm). Figure 7. Lateral view of the interior of my server. You can see the front and back fans. Also, marked is the area we will use to install out lateral fan (we can only install it there because of the fan depth, ~40 mm). Figure 8. Front view of the interior of my server. You can see the dust in the area where the front fan was installed. This happened in less than 3 months. First thing we do was to cut a circular hole in the computer case cover. I didn’t stick the hole template transfer (to avoid any residual glue after removal) but I used it as a guide to mark the case cover before cutting it. Then we cut two squares of foam of 13×13 cm. We made a circular hole in each foam square. Those will be the fan mounting pads for vibration isolation and sealing; the idea is to reduce the vibration transmitted by the fan to the case cover (with the internal foam) and seal the border of the mesh cover (with the external foam). Figure 9. Fan assembly in the case cover, formed by the fan, fan grid, mesh cover and foam mounting pads. We have to use eight screws. The tricky part is to keep the parts aligned while you insert at least one of the screws on the external side of the case cover. Why do we need the fan grid in the internal side of the fan assembly? This fan is pretty powerful (for a 12 cm fan), it can cause a nasty cut in the fingers and it can damage the power and data cables of the computer. 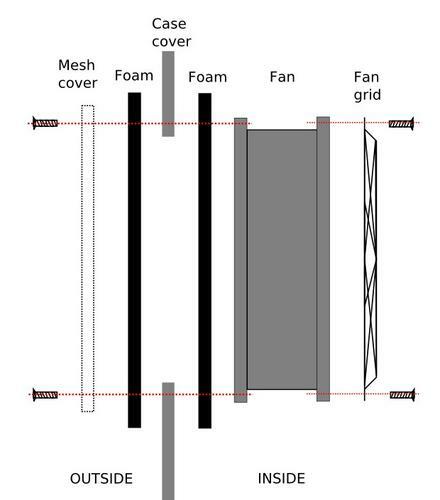 As you can see in figure 7, there are lot of cables that can get damaged if they touch the fan. Figure 9. 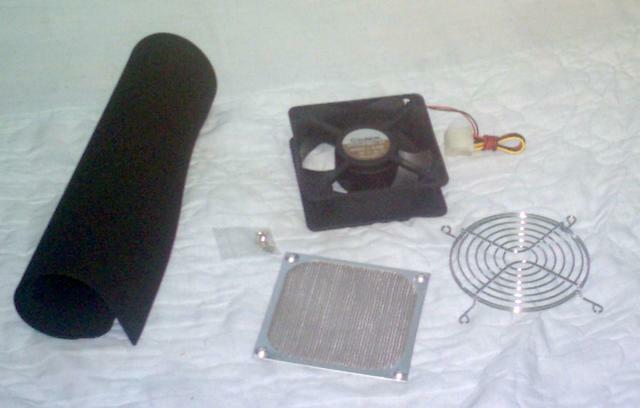 Some of the required components: the fan, the grid, the mesh cover, the foam and the screws. Figure 10. Outside view of the lateral case cover with the installed fan and mesh cover. Figure 11. Inside view of the lateral case cover with the installed fan and mesh cover. You can see that there are two rows of venting holes near the top and bottom of the cover. They are sealed with duct tape. Figure 12. View of the server with the cover installed. After powering up the server, the fan start to blow air into the computer case. We can feel the air flowing out from the case trough the front and back venting holes (lateral holes in the case cover were sealed, as shown in figure 11). We monitored the temperature of the processor to see if cooling was better or worse. We found that the processor was running 2 Celsius degrees cooler compared with the case without the lateral cover. As mentioned above, I underestimated the noise level of this big fan. I don’t have an audio meter but the noise “feels” like twice as loud as my previous setup. 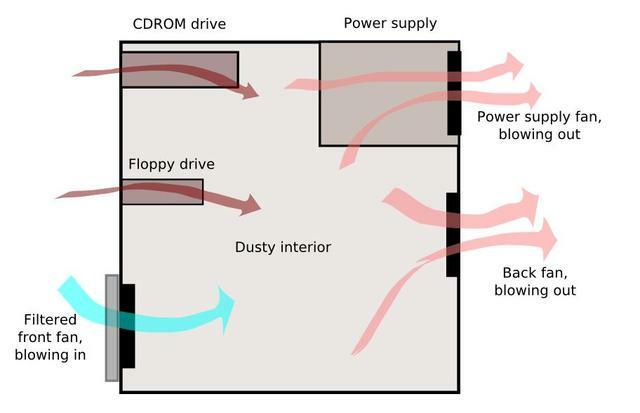 At the beginning of this article, I mentioned the use of a vacuum-cleaner filter to stop the smaller dust particles, but that a filter can reduce the effective airflow of the fan drastically. As I didn’t have a vacuum-cleaner filter at hand, I used a piece of a surgical mask as I have plenty of them available. I cut a 12×12 cm square and place it in front of the mesh cover. Thanks to the vacuum created by the fan on the mesh cover, my filter stays in place without the need of glue, tape, or something. However, please note that common surgical mask filtering is not very effective trapping small dust particles. One benefit when using this filter is that the noise level dropped significantly. So this is the fix to the high noise level problem. (Another solution would have been to use a fan controller to reduce its speed). So, did we reached our goals? Well, 5 out of 6… not that bad. This clueless guy just finds out about the positive pressure concept ! Well, suffice it to say that all clean room facilities use this exact concept, even lousy transformer winding manufacturers have some sort of positive pressure semi-clean warehouses to keep extremely hygroscopic material (paper) free of moisture, and windings free of flying particulate. Anyway, I am only wishing that surgical rooms will sometime be benefited from this jerk wondering about this grossly inefficient way to provide a steady stream of fresh clean air. As a last desperate suggestion, please look at the pressure drop concepts, this will at least give you a clue about the instantly efficiency achieved by you filter (aha!). Anyway, I’ll try to address your concerns in this reply, my dear friend. First, I know lousy manufacturers use kind-of clean facilities, even if I have never visited you at work (Prolec). About the surgical room thing, you should know that most operating rooms indeed use a positive pressure setup, usually with air flowing from top to bottom, at around 30 fpm. Actually is a laminar flow setup (obviously with positive pressure, as air is blown in and exhaust is usually done passively). But I should warn you, nobody knows if it works! (Don’t ask me for details, visit PubMed http://www.ncbi.nlm.nih.gov/entrez/ and do your own search, or visit the ASHRAE web site http://www.ashrae.org/ for some tips). Oh, and congratulations for your new baby, Israel. I recently had a chance to look at your filter set up, and let me tell you, snipping the top creases of the folded paper is a perfect way to render the filter useless… air will slip by the openings instead of going thru the paper… well I suppose you know that already, air head ! Thanks for the kudos for my boy. Hola!, solo quiero comentarte que encontre por casualidad tu pagina ya que estoy por instalar el oscommerce en mi sitio y estaba buscando un manager. De hecho me identifico un poco contigo (y perame, perame, perame, no son jaladas gay ni mucho menos ;) , lo que pasa es que tambien me gusta programar en Delphi y tambien me gusta desarrollar pequeñas aplicaciones de codigo libre. Me da orgullo de que seas paisano (yo soy de Queretaro) y te animo a que sigas por ese camino. P.D. Y ya que estamos en esto, ahorita estas de Freelance? podrias ayudarme con algo de programacion? It sounds like you really did your homework. However, I do not think most people want to cut a hole in the side of their computer case. Please don’t take it the wrong way I think you have shown some good engineering skills. So why not just buy a plastic computer dust enclosure. They cost $365 What is your time worth? All this engineering and then the blog to help others is certainly worth $365. When I was a teenager some old man told me something that I will share with you. He said young people often Want a job say for example as a journalist perhaps a foreign correspondent but end end up taking a jog doing something else and the waste the time and the energy. You have diagrams and alot of engineering that went into this idea to the point where you could make your own invention. You can file a provisional patent yourself for $100 and you have a year to file the actual patent. You must have many inventions that are patentable. You underestimate what you are cabable of achieving. There is the opportunity cost and with all the engineering you have done why did you not just manufacture your own cabinet? Basically after all this time suffering with the dust problems we just bought a dust cabinet at our shop. I want ti tell you what I bought the Valley PlasticsTm Computer dust enclosure from Thompson Plastic And Chemical of Toledo Ohio. It is very and durable reinforced with carbon fiber and Kevlar that bullet proof plastic stuff. In your design notes and drawings there is no way to change the air filter as it is bolted into place. A real expensive metal enclosure is the Dust Sheild and they reccomend changing the filters bimonthly in the shop environment I am in so unbolting the filter was not practical and our insurance would not allow us to cut into the casing. So we tried those dirt bags but although they helped a bit they got so dirty in 2 weeks that we wanred to change them but they said they would last for 9 months. We had problems after about 2 months and a hard drive crashed from overheating and because we were using the Dirtbag the manufacturer HP would not replace the hard drive. We build our own computers at the shop so we had to buy the Valley computer enclosure and go with seagate for the new harddrive unit. would need to be changed at least bimonthly as would the dirt bags. So let me tell you all about them dirt bags they are made of polyester white plastic fiber media and is a sewn bag. I understand that it is a very popular idea but I suspect that many of the people who bough them found out that they have to be changed as frequently as any other filter. So it was a real problem for us. And I liked your blog and this DIY stuff is facinating but basically there are guys trying to make a living selling the cabinets. I looked at everything Iknow what you know so all I am saying is there good people trying to make a living marketing these cabinets on the internet. The web trafic is about 10 people per day globallly for people searching for computer dust as keywords so I don’t see how any of these firms are making more thatn 30,000 a year selling the cabinets or filters per website whoever it is. Therefore, what anither point since this blog takes up page one many of these keywords what i have to day is while it is appreciated all the good work you have done I had to buy the cabinet as an American supporting american entrepreneurialism. As Americans we all want to have our say but everyone had there own idea how do to do something but if we want to truely see the computer dust problem be solved since the manufacturers like IBM are just now getting into this market with a recent patent for laptop dirtbags we have to realize looking at some of the webcounters on these websites that ain’t a whole lot of demand out there for 1 billion people globally that have internet access and a computer that need dust enclosures not bags. Come one of the filters we first bought was polyester and 1 inch thick untill a folded thin filter replaced it and we noticed a big improvement. So I know for a fact having used different filters and from corraoborating your assumptions for the positive air flow that it has to be that way and if you are going to use the polyester white filters they have to changed bimonthly minimum. You can’t just rotate those bags and we had problems enough with HP on our warantee before we found seagate and the Valley Plastics TM Plexiglas Computer Dust Solution. I am not tyring burst your bubble but you can’t have it both ways you either believe in the box you built similar to what I bought or you don’t I do not think that people firms can aford to spend $4800 a year on dirtbags I going to buy the Valley Plastic Tm tower computer cover because I can throw out the filter once a week and buy year supply for $0.50 apiece. End of story period. If I had the money I would of bought the completely bulletproofed and fireproofed for just under $1000. Whatever it would of cost who cares its cool and I have some real protection in any circmstance. One more quick point bro the foam that you are using is that black foam stuff. All of the flat foam filters and the polyester does not work very well at all. The filter if go to the hardware store has to have pleats or folds like the ones that you buy for you furnce at home for that DIY project. Just hear me out bro you cpould take those cut them to size after removing the cardboard fram and that woulf gove you the best level of protection. End of story no one else is going to sell you them because you have to be a manufacturer to buy them and if told them what were doiung with it they would tell you that they don’t sell it anymore. So after that you need a slidable removable holder or a machined retainer clip tht you would have to buy form a manufaturere of purchase material and equipment to make yourself. So when its all said and done the Valley Plastics Tm Computer dust cabinet already has these elements and the patent is pending. So it really is the best choice because they are in business toand can manufacture the box and the replacement filters for the lowest costs. stupid william , i think he has a lot of pocket money..
great work man. you have explained ith very scientifically and the positive pressure sysytem is excellent. Everything is fine with the design of this system but for one thing- what a schlep to clean the filter. Dismantling the whole fan assembly. This might have to be every week. I have found the perfect answer. Check out a website called http://www.demcifilter.co.za. Well first off I agree that most people don’t want to hack up their computers with holes or have the proper tools to do so. The rest of the people are afraid to open a computer or don’t know how, infact they can’t be bothered to clean the outside let alone the inside. For those that wish to have a self cleaning computer they purchase a ” Dust Hero ” This was originally called XLx2 by the inventor. I have had an original sin 2005 and believe me it works. I just simply pop off the front cover, pull out the filter material and stick in some new filter material every couple of months. No mess or fuss. I also tried putting in a auto scent freshner between the filter material, the type that hangs from your rear view mirror and now my computer is also a room air freshner. Cool !! I suggest you view the websites for the product. It cost nothing to look. This is a great post and is just what I need to get started on my own dust-free enclosure. As another poster suggested, the technology exists already in expensive laboratories and we can buy expensive solutions to do the same thing without taking up our time, but creating something yourself and sharing the lessons learned along the way is an admirable endeavour. The human race would progress a lot faster if everyone contributed in this way. Well done to you and thanks again for the post! The best and easiest solution to the PC dust problem? #1 a clean room # 2 DEMCiflec Dust filters. No lies . SAved me hours of time on the shop floor. Especialy around the welding area. I couldn’t believe how much the filters pulled out of the air. I can’t believe the computerws ever worked. Amazing. I found the other dust filters. Advise is a good or bad the dust filters? Great article by you, and food for thought thanks to people like you that give their time unselfishly to helping others make it a better world for us all. Personally to deal with dust in my own computer I have done the following over many years. I own 2 identical computers. One is just stored and kept on standby. Once every six month I swap them around. The one I have been using containing 6 months dust is taken outside. Covers removed and then with a garden hose and jet nozzle I blast out all the dust thoroughly with water. This includes all the inner parts of the computer CPU and power pack including all cooling fans. Then this spotlessly clean computer is left in our steel garage (which heats up each day) with the sun like a giant drying cabinet. Most of the dust in any home comes from the people and pets that live in the house. We literally shed our own dead skins every few days, I think why we all are so fascinated by computers is the human race are (thinking animals) and a computer is to many like a living thing (Thinking machine) so maybe there is “Simpatico of feeling” between our computers and us all. Maybe for many they are mechanical “amigos”. Thanks Mario! That was a thorough and well written explanation. @Pedro: I believe we all shiver at the idea of ever cleaning a computer with any significant amount of water, but if it works for you, great. Personally, I’m way too scared to use water to clean my computer. Great article. Some crazy comments. Building my first PC in about 5+ years and I needed a refresher course on air flow and keeping dust out. This gave me some food for thought. Though I do think there are simpler solutions (that don’t involve overpriced cabinets and covering your PC in a rather ugly bag, for the home user at least). For home use I’ve used dryer sheets (used ones) on the outside case on the fan intake ports, securing them with duct tape, with some success. But you still need to clean and replace them every 3-6 months for them to work effectively which is a pain. Others have used pantyhose, stretching them over the fans and securing by tying a knot in a corner, once again cleaning is a pain. Thanks for putting this out. Good job. *** Make sure you have higher CFM in than out. *** Make sure you provide adequate internal airflow. It doesn’t matter how many intake and outtake fans you use, just make sure the total CFM of the intake fans exceeds the total CFM of the outtake fans. Ideally, the least amount of positive pressure that can be consistently maintained is best. This provides the most efficient power draw to CFM ratio by reducing excessive strain on the intake fans which extends their usable life span thus drawing the least amount of power. The concept for pulling all the air in one location so the filter media is more easily managed is fine. However, you have to be cautious of the airflow inside as it will be limited via the single intake fan, GPU and CPU fans. 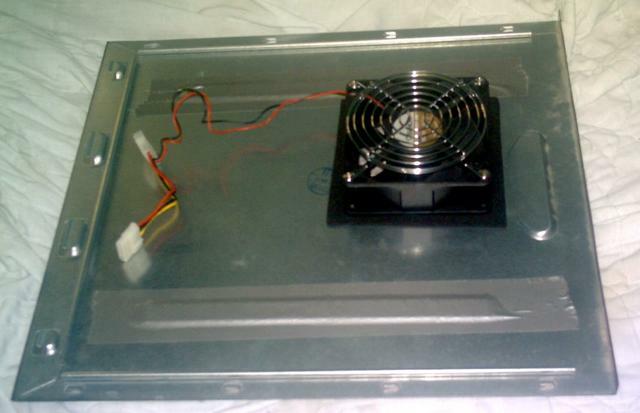 – Several strategically placed fans throughout the inside of the case. – Pay special attention to dead airspace around components releasing high heat. – Direct the appropriate fan (Size/CFM) at these locations to evenly disperse heat buildup. – Make sure you use a thermal gauge and alarm to effectively monitor the inside air temperature. – For larger enclosures you may need to monitor several locations with thermal gauges and alarms. – The sensitivity (accuracy/tolerance) of the thermal gauge(s) should be +/- (2°F). – The temperature alarm should be set to 5° above room temperature (75°F – 78°F). Over the past 20 years, I’ve built many custom rack systems and mainframe counsels, both small and large form factor, for the aerospace, industrial and multimedia entertainment industries. Guys none of these solutions are a long term fix and there is the danger of damaging components!! The compressed air has a moisture problem , the filters they sell us do not work down to a certain size dust particle and if the mesh is too small then we sacrifice airflow and get overheating…Remember that dust is the primary cause of component failure especially in hot running components such as graphics cards…I have found a product that is coming soon and they have solved all of our dust related problems…We need a permanent fix without stripping cleaning and all the headache of damaging components…I have found the solution coming soon , do yourselves a favour and have a look!! Dust will eventually setlte on to the floor and other surfaces if you don’t stir it up. Any kind of air currents will stir it up. The air in a vacant warehouse that’s extremely dusty and dirty can be very clean because all the air particles fall to the floor due to gravity. This the filter http://www.dustend.com has the low air resistance.